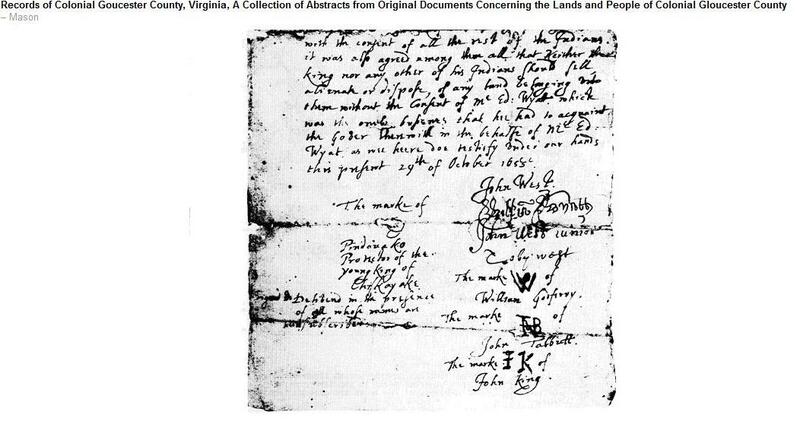 A reader sent these two images of a 1655 transaction in Goucester Co. VA – one of which is transcribed. Interestingly, I have never run across this tribe or the reference to the Chiskoyack before. Hat tip to Tommy for this information. This entry was posted in Chiskoyack, Virginia. Bookmark the permalink. I belong to a small tribe in Sampson co. N.c. that only has around 3,000 members, they origianated from the nousook tribe who saved the Raleigh colony in the 1600s then they helped the tuscarora in the war of 1715 when the army almost whiped out those tribes and the tribes that pitched in to help during that war, then all those tribes went into hiding and eventually inter mixed with each other so I am a part of several of those tribes. Thru history it has been reported that from people’s observations of the people of my tribe they reported seeing most of my tribal members with blue or gray eye’s. Most believe this could have been from the Raleigh colony mix. That is amazing. Thanks for sharing this, and thanks to Tommy. I always wonder if the Natives knew what they were signing and what this particular deal really was about and what happened later. Would be interesting to follow and research these people and land transaction further in the records. The above Indian Land Grant is part of my farm in Gloucester, Va Edward Wyatt was granted a track by the young Kisakiack chief. The original document is in the Huntington Library in California. This has been a working farm since 1655. The Farm is named BOXLEY after a Parish in Kent, England, the ancestral home of the Wyatts. Edward Wyatt was nephew to Sir Francis Wyatt the first Governor of the Colonies at Jamestown, Va. I would be very interested in more detail on this tread because in theory the young King/ Chief would of been the son of Opechancanough (My great grandfather), who was paramount chief of Tsenacomoco and Chief of the Kiskiack Tribe. He was killed as a result of the Third Anglo-Powhatan War (1644–1646).